Flare tapered arms gently roll into modern wood block feet to create an elegant look in this transitional style cuddle chair. The extra wide chair seat provides ample space to relax with a good book and your your favorite drink. Meanwhile an off-white accent welt adds style and personality to your living room. Transform your space into a stylish and comfortable room to unwind in with this upholstered chair. The 2650 Transitional Cuddle Chair with Accent Welt by Serta Upholstery by Hughes Furniture at Rooms for Less in the Columbus, Reynoldsburg, Upper Arlington, Westerville Ohio area. Product availability may vary. Contact us for the most current availability on this product. 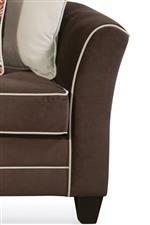 Arm Flare tapered arm brings a transitional look to your space.